Really the holy card image of the Holy Family lacks any of the struggles and hardships that in reality were the lot of the Holy Family. Evidently Joseph died before Jesus was thirty since he is never mentioned later in the Gospels. Of course Mary will endure the death of her son three years later at thirty-three. The joy of the resurrection will be tempered by His absence forty days later at the Ascension. The Holy Family experienced almost any tragedy that we can place in our experience of family life. When we call on Jesus, Mary and Joseph we should be mindful of that...the struggles of life are not ours alone to bear. Heaven lowered itself not into a plush life but into the very sorrowful existence that is ours. It is important to focus on the reality of the Holy Family so that we can capture the meaning of the prophecy that is made by Simeon today. It is one that sees God's promise fulfilled in the infant Jesus but at the same time predicts hard times. God's blessing is not always what we might expect. It is not the Gospel of wealth and prosperity that is sometime proclaimed by the televangelist--it is one of being misunderstood, contradictions and the piercing of the mother's heart as she witnesses the death of her Son--the Son of God. Coming back to Mass at Christmas? Know someone who might? 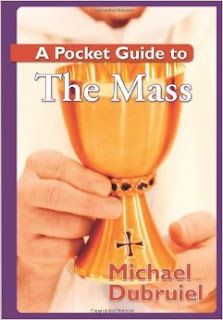 The How To Book of the Mass is a great re-introduction to the Mass for those who are returning for a visit.